We started the New Year in Split (Croatia). We then followed the Adriatic Coast into Bosnia. Just 25km later we were back into Croatia heading to Dubrovnik. We then reached our tenth country – Montenegro! Here we visited Tivat, Kotor, Cetinje and the capital of Montenegro – Podgorica. 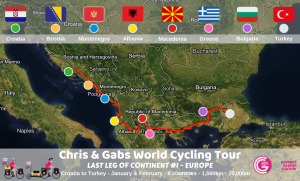 We ended the month in our eleventh country – Albania! You can watch our recent film about Croatia and Bosnia here. Montenegro – We cycled along the coastal road from Tivat to Kotor with views of the snowcapped mountains and clear crystal water. 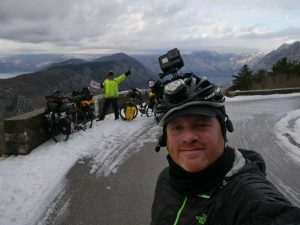 We decided to then cycle from Kotor over the Serpentine Mountain Pass to Cetinje. 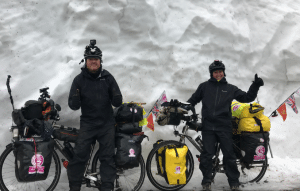 This was the most incredible Pass we have ever cycled, we were looking down onto the tops of other snow caped mountains with clouds surrounding us. The most challenging part of the pass was a short 8.3km stretch with 26 hairpin turns called Kotor Serpentine. It is one of the world’s most famous hair-pinned roads. 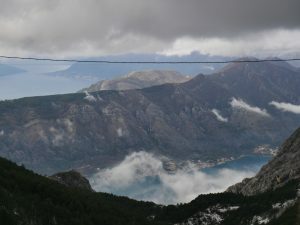 The road is mostly a narrow one lane road offering stunning views of Kotor from above. He lost control of the drone and watched it dive bomb into the sea. The drone is still in the sea. Chris was also finding it difficult to control his bike. He was unable to keep it steady but later realised he had a badly buckled front wheel! Luckily he was able to repair it in Montenegro. When we FINALLY reached the top of the Serpentine Pass, and reached the Lovcen National Park, the road was closed due to all the snow! We had to go a different way but the temperature was dropping (-10) and the snow was getting so heavy. We were in the middle of nowhere but knew we had to keep going. Luckily Gabs spotted a ranch house in the distance and excitedly shouted to Chris, “STOP the sign says rooms and restaurant!” We were so excited to find somewhere to shelter and eat that we found lots of energy to get there! But…when we got to it… the sign said nothing of the sort. It was just Gab’s mind playing tricks on her. We were so pleased to have made it to Cetinje as the snow was unbelievable. We stayed with another lovely family, and Krsto went out of his way to show us around his town. When we were in Italy we stayed with Priest Arian in Montepiano. From that day he has become a special friend to us. 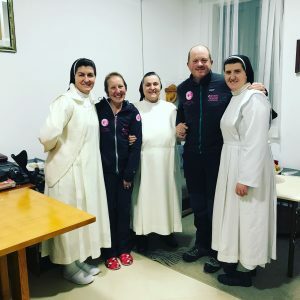 Thanks to Arian, we were welcomed into the home of Sister Vera. We had an amazing time with her in Shkoder (Albania.) We wish we could have stayed longer but the longer we stay the harder it is to leave. We had three wonderful days there. They took us out each day, showed us the sites and told us about the history of Shkoder. 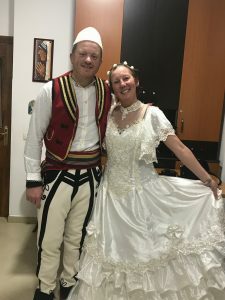 It was a blessing to live with the lovely Sisters and the rest of the amazing family – they have given us so many happy memories.One evening we experienced traditional Albanian dancing. We even joined in and were dressed up in their traditional costumes. We both had so much fun. Well I did…. I’m sure secretly Chris loved his costume. Sister Spring said she had a surprise for me and dressed me up as a bride… then the Sisters FaceTimed Priest Arian in Italy! I thought he was going to say our vows over the phone, Chris by this time was sweating and getting very worried. We didn’t get married. 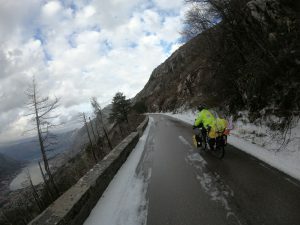 This January, we cycled through metres of snow in Montenegro and then were hit by a strong storm when we left Shkoder. 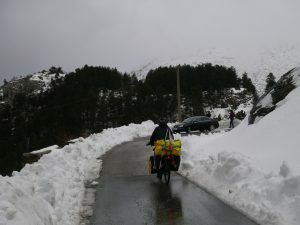 It was so windy it just blew us off our bicycles, but we had to continue to get to a safe place. I thought it would be unbearable and break me camping in the wet and freezing cold, but it has turned out to be a lot of fun, it is more bearable when you have a fire to keep you warm and somewhere to dry your clothes. This month we gained a follower from America who shared with us that her sister has breast cancer. Before looking at our website and reading our Cancer Story, it never occurred to her about preventing breast cancer. She went on to read all about Prevent Breast Cancer and was completely inspired by all our research. She kindly donated and is now learning how to be breast aware and looking into the steps she can take to reduce her risk of getting breast cancer. We are now heading across Albania into Macedonia, Greece and Bulgaria. Hoping to get to Turkey for March. The start to 2019 was a good feeling, we both felt so different within ourselves and our set up on the bicycles felt much more organised – it was the start of our next stage. Being in Eastern Europe made us excited, it was all new to us and the countries are so different from where we have come from. Knowing we are so close to our second continent was a great feeling. 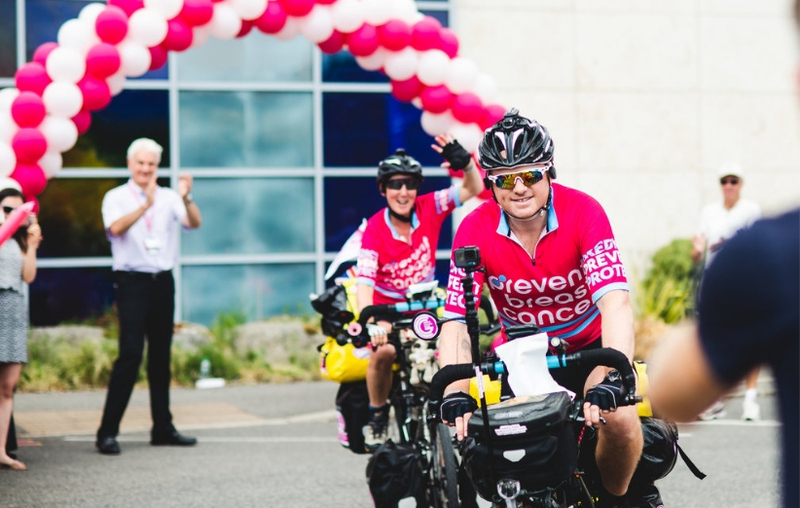 To see where we started from on our tracker and to see what we have achieved on our bicycles is encouraging. When people ask us what’s our favourite place, it never comes down to the most spectacular views or prettiest town with all its luxuries, for us we always remember the country from the wonderful people we’ve met and the memories we’ve made with them.